In this phase,PMR validates the data using macro and micro economic factors. For instance, growth in electricity consumption, industry value added, other industry factors, economic performance, growth of top players and sector performance is closely studied to arrive at precise estimates and refine anomalies if any. The population explosion across the globe, especially in developing countries such as India and China has triggered the need for advanced agriculture equipment. It has been projected that the world population will increase by over 30% by the end of 2050. The population is anticipated to be more prosperous and urbanized in upcoming years, with a better standard of living and healthier diet needs. 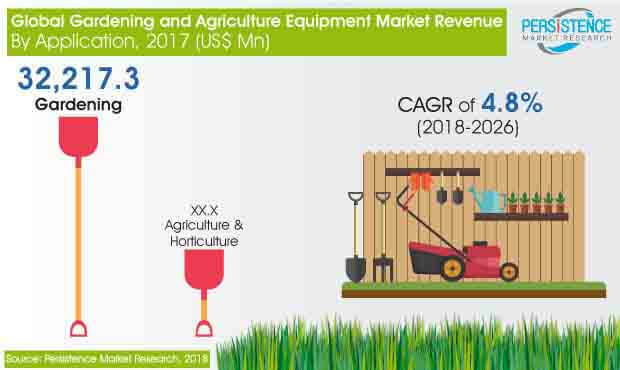 Pressing need for food is expected to surge the demand for agricultural products, which will increase the demand for technologically advanced gardening and agricultural equipment. The increasing DIY trend amongst people is a factor contributing towards the increase of the o the growth of gardening equipment market. The obtainability of various versatile equipment with ergonomic designs has resulted in a rise in the demand for gardening equipment globally. As per U.S. Government’s instructions and guidelines, community garden plots are also deliberated as an important part of society, which will continue to fuel the need for gardening equipment in near future. The accessibility of modern designed equipment for various sizes of gardens assists the users to choose different gardening equipment. Tautened rules and protocols concerning periodic conservation of gardens in community and private premises seem to boost consumer interest in gardening, which in turn pushes the sales of gardening equipment in the DIY market. Ergonomic designs for gardening equipment is one of the most significant driving factors for the global gardening equipment market. Many companies are adopting ergonomic designs in gardening equipment; AMES Companies, Inc. has developed products with ergonomic designs, as people prefer equipment that cause less strain while gardening. Digging equipment developed by Radius Garden have eGrip and comfort GEL technology in them. Gardening equipment can be daunting to people who have arthritis or any other joint problems, and hence, people prefer to opt for ergonomic gardening equipment. People tend to choose gardening equipment that are ergonomic, which eradicate pressure and give a good grip so as to eliminate the possibility of injuries. Among city planners and real estate agents, the demand for landscaping in commercial as well as residential areas has risen substantially. Around more than 60% of people tend to pay more for an apartment or residential space with more gardening area. The demand for landscaping is rising in order to provide an artistic appeal to residential and commercial properties. Landscaping adds to the resale value of a building, and speeds up its sale. A few other advantages of landscaping include restoring native plants to residential landscapes, adding plants indoors to improve the quality of air and human productivity, using plants as a food source within the residence, and for efficient waste removal by creating residential composting systems. In many countries, the governments provide extensive upkeep to farmers to procurement agricultural tools to work more efficiently. Government offers crop loans, credit schemes, and subsidize interest rates, which trigger the growth of agricultural equipment market. The demand for agricultural equipment is anticipated to foresee noteworthy growth over the course of the forecast period. This strong growth can be attributed to shift of agricultural activities from animal or manually operated to professional work. Dynamics such as rising urbanization rate, government initiatives, and timesaving are altering the focus of farmers to automation and refining their investment power.